No one likes to dry their wet hair by using just an ordinary towel as it’s quite inconvenient. Moments like these can get pretty annoying, resulting in the use of hair dryers that can cause heat damage to your clients’ hair. Isn’t it better to switch towels than to make hair go through that terrible ordeal? Get Salonwear hair turban that covers the entire head and keeps the clients comfortable. This fluffy hair turban towel wrap is a unique product that provides you complete comfort. The turban hair wrap also acts as a protection gear while your clients avail any spa and salon services. Salonwear’s natural hair turban is fabulously designed and is one of the best hair drying turbans that can be found in the market. 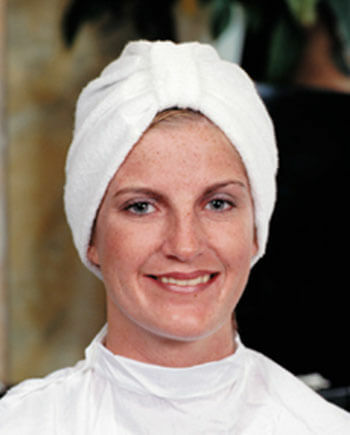 Whether your clients’ hair is long or short, this hair turban towel wrap will soak the moisture very quickly. Faster drying equals saving time and focussing on other salon and spa services. Even with its thickness, Salonwear’s hair turban dries itself super fast and stays in place on the head. The strength of the knit terry material makes it reliable for long-term use without getting scruffy as standard bath towels do. We offer turban towels for wet hair at very competitive prices. Our hair turban headbands are of top quality and are sure to impress your clients. Our terry cloth hair turban covers the head completely and comfortably. The towel turban for long hair provides complete coverage and safeguards hair from unwarranted heat or dust in the environment. We sell only the best hair turbans on our salon wear website. The other types of headbands that we offer include hair wrap twists and terry headbands. Salonwear’s wet hair turban is made from stretchable knit terry material that has superb water-absorbing properties and thus helps in drying the hair faster. Currently, this wet hair wrap towel is available in one size and is made of a blend of 75% Cotton and 25% Polyester. The user-friendly design makes it easy to be used by all clients. The Salonwear terry turban hair wrap is available in a crisp white color. White color ensures that the salon or spa looks elegant and professional. Why Should you Choose our Hair Drying Turban? Salonwear has been the leading family owned business in the beauty salon and spa industry for the past 31 years in the USA. These years of experience have made it possible for our company to innovate and introduce products that are of high quality, contemporary and functional. We have a wide range of spa and salon products that have successfully satisfied all our clients’ requirements. We have a large pool of happy and satisfied customers. With our hard work and high-quality customer service, our Salonwear family is ever expanding. You can also visit our trade show page for more information. Towel was and will be the preferred item for drying your wet hair but headbands are more efficient along with having a tight grip on the wet hair. Headbands tend to look more stylish and cute than those conventional towels. Headbands are more comfortable as they cover the whole head. Headbands often come in varying size or a fastener is attached so that the size can be adjusted according to the head. Towels are less preferred by customers, as they are less cozy and soft when compared to headbands.